dextadriver and 1 Guest are viewing this topic. do they ever have any bogof or 3 for 2 offers on tenners? No, they only take plastic. For our Sunday morning walk today, we spent the time delivering a local newsletter, something we do four or five times a year. But before that, I managed to clean all the running lines (UP main, DOWN main, branch, milk loop and goods loop). I used my usual IPA and cardboard method (thank goodness I saved all the Metcalfe kit packets) and then, after each section was cleaned, I ran over it with my Dustbuster to make sure that there were no loose particles or Peco track rubber residue to gum up the works of my locos. When we returned, we had coffee and then it was time for serious crop picking, first blackberries then peas and beans (runners, fine beans and borlottis). The beans are disappointing so far this year, although the peas should reach the 2016 total of 16lb, which is far below last year’s bumper crop of 24lb. Later, after something to eat, I picked tomatoes, lots of Sungold and our first Ferlines, an outdoor variety with good blight resistance. They are quite large which means we won’t need to buy any more large tomatoes for tomato salads, at least not until the end of Autumn. Then I lifted a cabbage for our evening meal, together with carrots and a couple of roots of potatoes. After a cup of tea, I went back to the Train Shed and moved everything out of the UP loops ready for cleaning in the morning. Here’s a shot of five of them stabled overnight in Marton Hinmarche station. On the left, in the milk depot, is Ditcheat Manor with the parcels train. On the next track, at Platform 4, is 80119 with the six-coach suburban train while on the other side of the island platform, on the UP main at Platform 3, is Forthampton Grange with its eight-coach corridor train. On the DOWN main at Platform 2 is Jubilee Class ‘Eire’ with its ten-coach train while, on the far right, is J39 64960 with the local pick-up goods. Tomorrow, it will be on with the track cleaning. Monday is table tennis day, but before we went off to the gym, which is where we play table tennis, I managed a quick session in the Train Shed. I cleaned all the tracks in the UP loops and began to move the trains back from the station. Sadly, I only managed to move three: Ditcheat Manor with the parcels train from the Milk loop, 80119 with its six suburban coaches from Platform 4 and Forthampton Grange with its eight coaches from Platform 3. Then it was time to go off to the gym. We had coffee at the gym and I had to pay in some money (sadly, not mine) on the way home. By the time we arrived home, things were beginning to hot up, so we opened up everything and put out all the cushions ready to eat outside. In the afternoon, I did another two hours shredding, which completed all the hedge trimmings on the lawn (sorry grass). But I now have a lot more to deal with as there is a big pile on top of the compost bins that I need to move before I can do any more compost transfers. After a cup of tea, I was able to return to the Train Shed to finish moving everything out of the DOWN loops ready for cleaning. Here is the next set of trains parked in the station. On the left, in the milk depot, is 61664 ‘Liverpool’ with its eight coach train. 61664 is always a problem on the crossover complex into the milk depot because its bogie derails more often that not. However, because it only ever uses the crossovers during track cleaning, I am loath to do anything about it. On the next track, at Platform 4, is Cranmore Hall, with its nine coaches. Then, on the other side of the island platform at Platform 3 is 92006 with the fish train. On the DOWN main, at platform 2, is Royal Ulster Rifleman with its twelve coaches that are two long to fit into the platform. Finally, in the goods depot, is Stanier Class 5, 45206, with the milk train. Tomorrow, there will be more track cleaning, followed be returning the trains to their correct starting positions. we opened up everything and put out all the cushions ready to eat outside. Do you eat your cushions with chips, rice or half and half, Laurence? No, they're used to cushion the effects of forum humour. Some sort of buffer, eh? As long as it's not a boring old buffer! Today, it was off for a swim at the gym. Before we went, I managed to clean all the tracks in the DOWN loops and the started to move the trains back to their starting positions for the operational timetable. Then, just before we left, we received a phone call to say that Celia’s Pilates class had been cancelled. However, we went off anyway and Celia did some self-controlled Pilates while I had my swim. But the pool was very crowded (probably because of the hot weather) so I curtailed my swim to sixteen lengths. After a cup of coffee at the gym, we set off for J Sainsbury. Now, last week, on the radio, someone advised that the best way to cool off during the hot weather was to go for a walk around Sainsbury’s. I must say, it is always cold in there, the air conditioning must work overtime. Later, I did some more moving of hedge cuttings, reinstating the pile on the lawn (sorry grass) that I had shredded yesterday. Then it was time for a cup of tea. After that, I completed moving all the trains back to their starting positions. Here you can see the UP loops all ready to run again. And here are the DOWN loops. By this time, the station was completely deserted, apart from the two pannier tanks, 6714 and 9744, parked in a siding close to the camera. Tomorrow, I will start testing the repaired operational timetable. I won’t get much done over the next couple of days because, after last week’s abortive caravan visit, we are going to have another go this week. Today we really did go off to the caravan. First thing this morning, I ran the first cycle (1a/b/c) complete with run-arounds for the branch trains. Everything on the mainline ran well, apart from the bogie of 45206 derailing in exactly the same place the Liverpool’s bogie did during the cleaning cycle. I don’t remember this happening before to 45206 but I may just have failed to slow it enough for the crossovers. I tried it again and it was fine at a slower speed, so I will let it pass for now. On the branch, all the operational activity passed without a murmur, although there were one or two sticking points during the running around manoeuvres. A few nudges were required here and there. There won’t be a lot more to report for now but, once we return, I should be able to carry on retesting the corrections in the timetable. Sooner or later, I should be able to get on with some scenic work again. The trouble with that is I don’t have a really clear picture in my head of what I want to do, nor how I am going to do it, but I guess I’ll muddle through somehow, which is what I have always done to date. I do like running trains and experimenting with timetables. Also, I quite like making videos of the trains running, but it would be good to have a finished scenic layout for them to run in. I’d also quite like to produce a BR timetable version of the operational timetable showing all the stations, trains, stops and timings. Just before we left, the postman came. He brought me two packets, one containing the pony trucks I ordered from DCC Supplies and the other containing a set of very fine brushes that I should be able to use to paint the insides the point blades to prevent the pony trucks from shorting. The spare pony trucks will be used to experiment with NEM couplings. If I can manage to fit them successfully, I will be able to convert the small prairies to easy-shunt couplings. I’ll keep you posted. When the long summer holiday starts, Julius and Marcus meet up in Rugby just like they do when they go train spotting. Only this time they make their way to Rugby Midland station to catch the branch line train to Leamington Spa, where they can take a direct train to Marton Hinmarche. They don’t take any luggage apart from a small bag of personal items because their main luggage is sent in trunks (one each) which are collected from school by a British Railways Scammell 'mechanical horse' and taken to the station for forwarding on. The Scammells are very useful vehicles because they can reverse turn into very tight spaces and, when they arrive at the station with a full trailer, they can drop it and pick up an empty one without having to wait for it to be unloaded. At the end of the summer holidays, another Scammell calls at Beresford Hall to collect their trunks before they return to school so that they will be there when the boys arrive at the beginning of term. When they are at home, they sometimes walk in to Marton station to do some train spotting there. 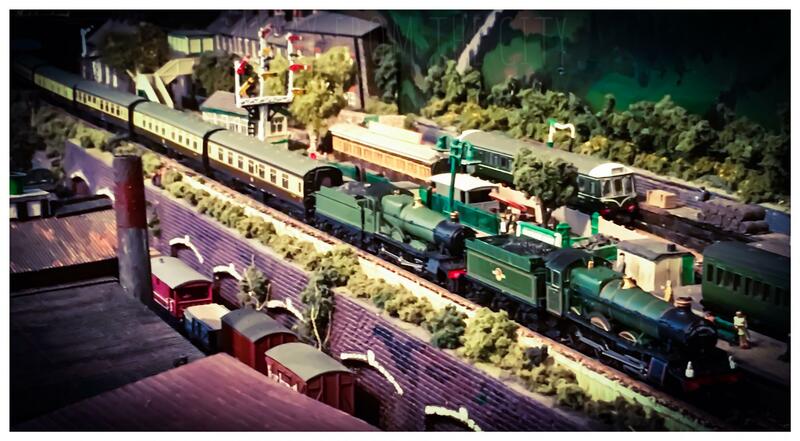 There are two non-stop expresses a day each way, the Dragon Beach Express, usually hauled by a Castle, and the South Midland Express, normally hauled by a Scot. Both trains run UP and DOWN every day, except Sundays. Also common are Halls, Granges, Manors, Jubilees and B17s. There are also plenty of freight and mixed traffic locos, so it can sometimes be a really good day’s train spotting. This morning we went for a nice walk in the sunshine at Brimham Rocks. Then it was off to Pateley Bridge for coffee before a nice walk along the River Nidd. On the way back we came across Pateley Bridge station. It turns out that this was the terminus of the Nidd Valley branch of the North Eastern Railway, which ran from Harrogate, leaving the main line at Starbeck. I gather it had a single platform, a small loco depot and a turntable. Passenger traffic ceased in 1951 and the line was closed in 1964, like a lot of other lines. After a quick look up and down the high street, we had dinner (sorry, lunch) in the George, followed by another walk along the river, this time going upstream. After that we returned to Knaresborough. Nice part of the world. Today was domestic chores day. I had already completed a few of them before my first foray down to the Train Shed. In that first session, I ran the next cycle (2a/b/c) including all the run-arounds at the hidden branch termini. In general, all went well, but the branch locos required a bit of encouragement during the run-around operations. Perhaps I need to give the run-around loops an extra special deep clean. The only exception was 64960, which had two or three really snorty stops and starts. I really must give it a good work over. Then it was coffee followed by more chores. After that, I did some picking. First there were a few raspberries, which are getting a bit thin on the ground (on the cane actually) and a few blackberries. Then it was the turn of the vegetables, potatoes, carrots, parsnips and cabbage. Finally, I turned to the legumes. They have been disappointing this year. There is only one row of peas left to mature, which will probably be picked next week. We might finish up with nearly as many as 2016, but much less than last year. As for the beans, there were only a few ounces of both runners and fine beans. I think it has simply been too hot and too dry. I have tried to water them well, but there may be too much Sun on the leaves and flowers. At least the climbing beans seem to have more flowers, so they might improve. I just hope they will benefit from a change in the weather. At this time of year they should be cropping well and go on right into October. Celia has emptied compost Bin 4 so, in the afternoon, I moved the contents of Bin 3 into Bin 4 so that she will have more garden compost to use on the beds and borders. Then, I managed another session in the Train Shed. This time, I wrestled with the prairie coupling problem. Here are the two pony trucks that arrived on Wednesday. Also, the four fine brushes that arrived (for painting the point switches) are shown here. I began the session by cutting off the coupling housing from the bare pony truck (seen on the right) and adding the thickest end of the shim to the back of an NEM pocket (on the left). I used Humbrol Liquid Poly for the fusion process. I filed the end of the pony truck flat and cut off the unwanted shim. Then I fused the shim to the pony truck. At this stage, I got a little careless, because I hadn’t secured the screw top of the Liquid Poly and managed to knock it over. I had to act very fast to prevent and absolute disaster. In the end, there was not too much damage, apart from a lot of Liquid Poly wasted. However, the atmosphere had become a little toxic and I had to open all the windows to allow plenty of air to circulate. Once I was happy with the pocket, I fitted the insert and, finally, added an Easy-Shunt coupling, making sure that I fitted everything the right way up. After that, it was just a case of removing the pivot and wheels from the complete pony truck and adding them to the skeleton. Unfortunately, I proceeded too fast and broke the bond between the shim and the pony truck (twice). But eventually, I got it all together. Now I think it’s a case of leaving it overnight to see if the bonds will be strong enough. I can’t actually fit the pony truck yet because I will need to fit two, one at each end of the loco. 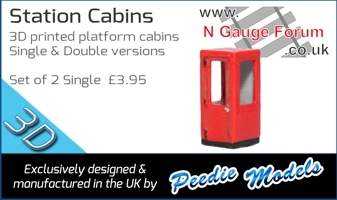 But I will also have to fit them to the carriage bogies as well, or they won’t couple to the loco. However, I now have the confidence to proceed with converting the couplings. I think my next task will be to convert the ‘B’ set. I can convert the end couplings and then run them ‘inside out’ with the Easy-Shunt couplings in the centre until I convert the loco. I also need to order some more Dapol Magnets. Those are very fine fine brushes, Laurence, far better than the cheap and nasty ones I bought, locally. (I'd have to go to a special shop to buy finer fine brushes but they still would not be as good as yours.) Where did you get them from, please? Page created in 0.227 seconds with 40 queries.